Hachiko Is Finally Reunited With Its Master! Their bond is immortalized in this new statue in Tokyo. 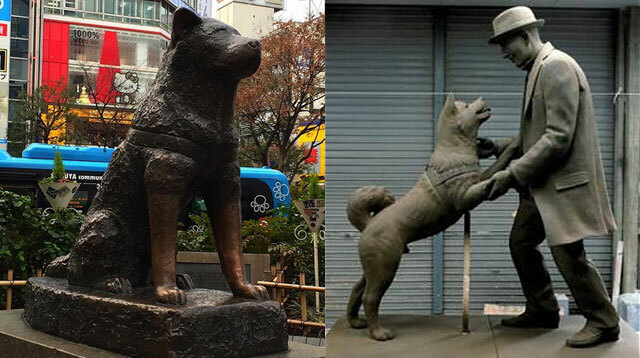 All is right in the world again, because the world’s most loyal dog, Hachiko, is finally reunited with its master in the form of a statue. Hachiko was born in Odate, Japan in 1923. The akita was known for waiting for its master, Dr. Eisaburo Ueno (a professor at University of Tokyo), at the Shibuya train station every day as the doctor returned from work. When Dr. Ueno suddenly died in 1925 of cerebral hemorrhage, Hachiko continued to wait for him at the station every single day for nine years. This story has touched the hearts of people all over the world. To honor Hachiko, a bronze statue in its likeness was erected at the Shibuya station, which has become a popular tourist attraction in Japan. This year marks the 90th and 80th death anniversaries of Dr. Ueno and Hachiko respectively. As a tribute to the inseparable pair, University of Tokyo’s agriculture department has erected a new bronze statue of the duo, together at last. Two movies have been released about Hachiko’s story. Hachi-ko Monagotori (The Tale Of Hachiko) was released in 1987, while an American version, Hachi: A Dog’s Tale starring Richard Gere, was released in 2009.